Combining the form-fitting ethos of Icebreaker's Anatomica collection with all-new ribbed styling of their corespun fabric, the Anatomica Rib Short Sleeve Crewe is equal parts style, comfort and performance. Ideal as an undershirt or worn alone on trail runs, hikes and extended travels, the Anatomica features their lightweight 180gm rib corespun fabric, which uses nylon fibers wrapped in soft, breathable merino wool for durability and strength that retains next-to-skin softness. They also included a touch of Lycra® for active stretch, and flatlock seams to eliminate chafing when you’re on the go. Anatomica Rib SS Crewe- Mens is rated 4.8 out of 5 by 4. Rated 4 out of 5 by Carkako from Confortable and high quality, color is off I'm a big fan of the brand and love the anatomica t-shirts. I love how they feel and wear them daily to the office as layers during winter time. I have several in black color. Quality is excellent. I was excited to purchase what I thought was a white or near white t-shirt to replace my cotton t-shirts but was disappointed the color was more light cream or light beige. I did not like it and the name of the color (Snow) and the sample in the website are a bit misleading. I hope they can be made in white color. Rated 5 out of 5 by DanishViking69 from New favourite! 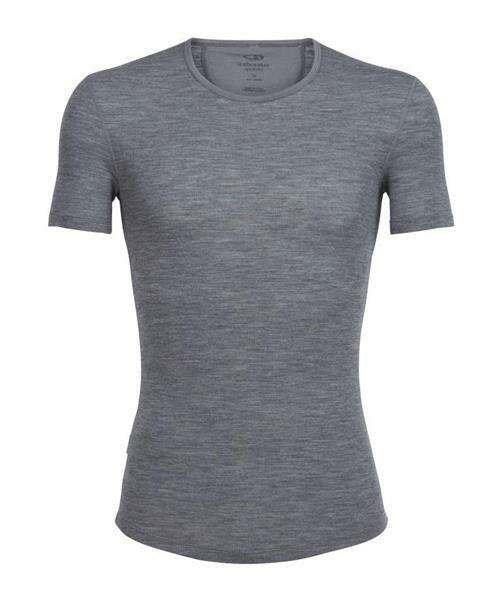 Love the fit of rib crewe t-shirt... awesome! Icebreaker has truly transformed the way I dress summer and winter - the dual season insulating comfort is remarkable, and the non-stink is truly amazing... and I now use same shirts as base-layer for a 6h hard bike-rides as I would then use next day for dressing it up with a sports jacket for a dinner or night out! Rated 5 out of 5 by RideLikeHell from Great addition to your wardrobe This shirt is a fantastic base layer for winter. I bought it in three colours. It fits small so you might want to order a size up from your usual Icebreaker size. I wish Icebreaker would sell this in more colours. How about jet heather and black? Rated 5 out of 5 by grumpybear from Good mid weight shirt The weight sits between 120 and 150 making it just a little bit warmer but not too warm for transitioning seasons.